I don’t even know the last time I did a face or eye of the day post. I don’t do them very often as my daily makeup doesn’t really change. However, since getting the Undress Me Too palette (Review and swatches here) by MUA Makeup Academy I’ve done a different look each day. So, today I thought I would share with your my EOTD post using the Undress Me Too palette and this little smoked out number I did. This look took about 5 minutes to do, so is really quite simple but is all about the blending. As its a dark look, you really need a couple of blending brushes otherwise you will end up spreading the shadow where you don’t want too. (1st colour on top row) Naked – all over lid. (5th colour on top row) Lavish – just in the crease. (2nd colour on bottom row) Exposed – from middle of lid to outer corner. (6th colour on bottom row) Corrupt – just on outer corner packed and re-blended into the crease to add depth. 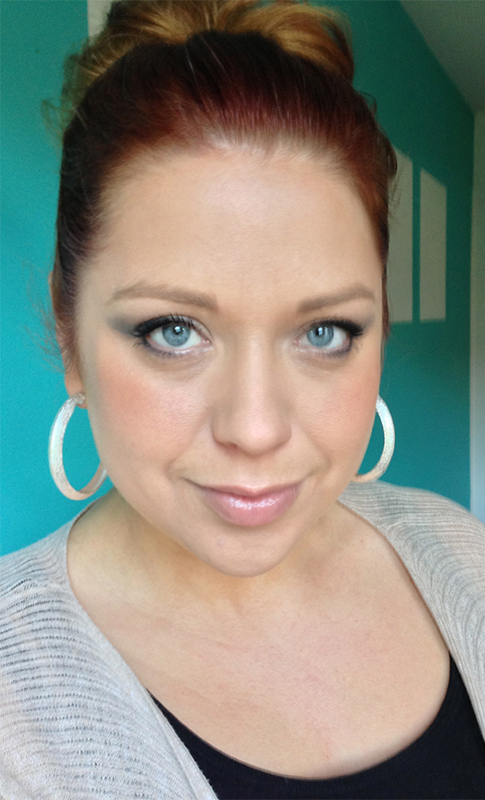 It was a nice fresh base using Rimmel’s Wake Me Up Foundation (Review Here) and the Wake Me Up Concealer. A little Living Nature Summer Bronzed Powder (Review Here) to warm my face and cheeks and the Sleek Contour Palette in light. For lips it was Sleek Pout Polish in Bare Essentials (Review Here). To finish the eyes I used my MAC Black Tracks gel liner and my favourite mascara at present GOSH Boombastic XXL Volume Mascara (Review Here). So, that was me today with my messy bun all set for a gorgeous Spring day!